The regular meeting of the City of Greensboro Minimum Housing Standards Commission was held on Tuesday, December 9, 2014 in the Council Chambers of the Melvin Municipal Office Building, commencing at 1:30 p.m. The following members were present: Justin Outling, Chair; Kimberly Moore-Dudley; Robert Kollar; Shermin Ata; and Horace Sturdivant. Owners. In the Matter of Order to Repair, Alter or Improve Structure. Inspector Jarod LaRue. 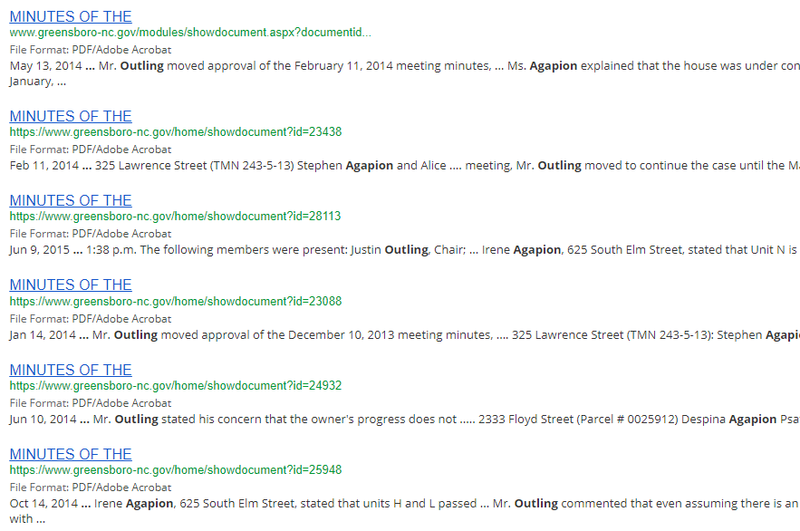 Chair Outling asked Compliance Coordinator Benton if the video that was shown was a fair and accurate representation of the property; if all parties in interest were properly served with all notices, complaints and orders issued in this matter; the last time the property was visited was December 4, 2014; the property is a duplex or multiunit apartment; there are more than five separate types of violations of any of the minimum housing standard codes. 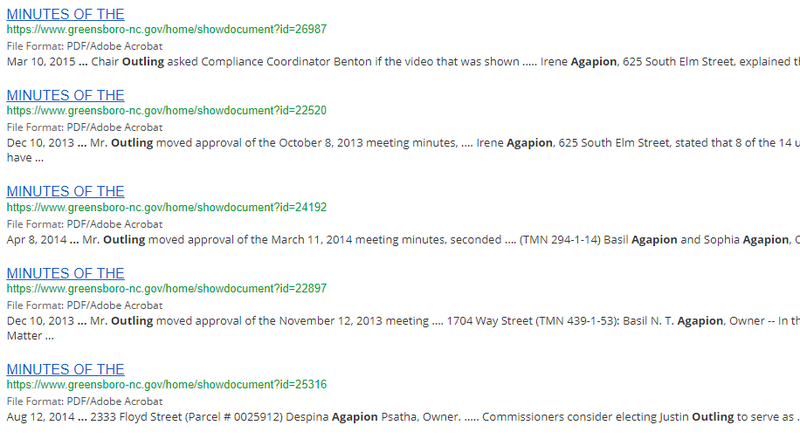 Compliance Coordinator Benton stated that she agreed with these questions. Compliance Coordinator Benton stated that the list of violations for Apartment I includes electrical equipment needs to be properly installed and maintained; exposed wiring at outlets and light fixtures; utilities for heat were not on at time of inspection; every dwelling shall contain a kitchen sink; plumbing facilities need to be maintained in safe, sanitary and functional condition; water not on at time of inspection; water heater not properly installed or maintained; heating system not maintaining 68 degrees in habitable rooms, bathrooms; plumbing not properly connected to public sewer system; unclean and unsanitary floors, ceilings, and/or walls; walls have cracked plaster, decayed wood or other defective material; loose floor covering must be repaired or replaced; rotten flooring must be repaired; ceilings contain holes, are rotten, or in disrepair; cracked or missing electrical outlet and switch covers; power not on at time of initial inspection; exterior doors are difficult to operate, missing smoke detectors; and a carbon monoxide detector is required. Apartment N violations include walls have cracked or loose plaster; unclean/unsanitary floors, ceilings and walls; duct system needs to be capable of performing its intended function; utilities for heat were not on at time of inspection; plumbing facilities need to be maintained in a safe, sanitary and functional condition; plumbing not connected to public sewer system; sewer line not properly installed or maintained; water not on at time of initial inspection; water heater not properly installed; doors difficult to operate; electrical equipment needs to be properly installed and maintained; power not on at time of initial inspection and carbon monoxide detector is required. 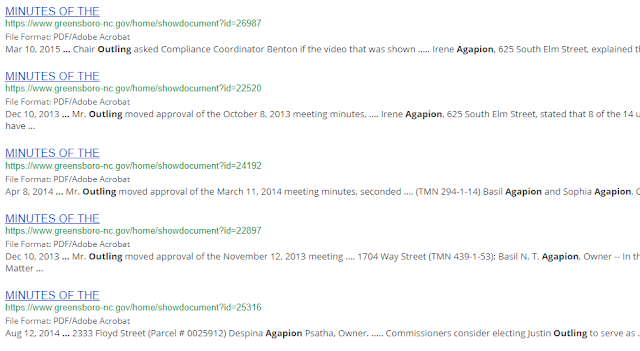 Irene Agapion, 625 South Elm Street, stated that out of the original 14 units, 12 have been brought into compliance. Apartments I and N are the last two units because they were in the worst condition. Since the last meeting they have applied for utilities. New gas lines must be run to these last two units. The contractor anticipates having both units completed by mid-January, depending on how long it takes to have the gas lines run. Mr. Kollar moved to continue the case until the February 10, 2015 meeting, seconded by Mr. Sturdivant. 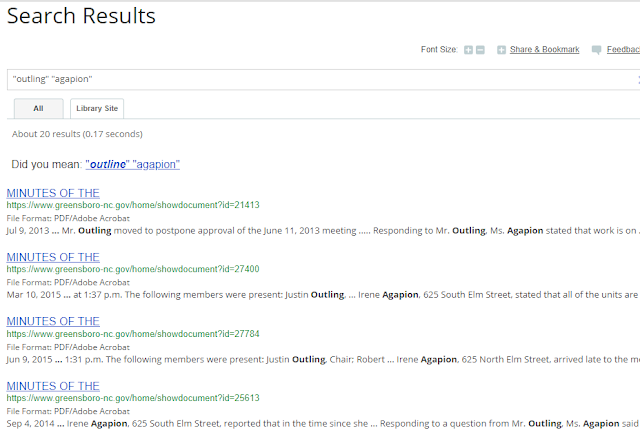 Why would the City of Greensboro take 11 weeks to produce an advisory opinion on the Justin Outling and United Healthcare conflict of interest? 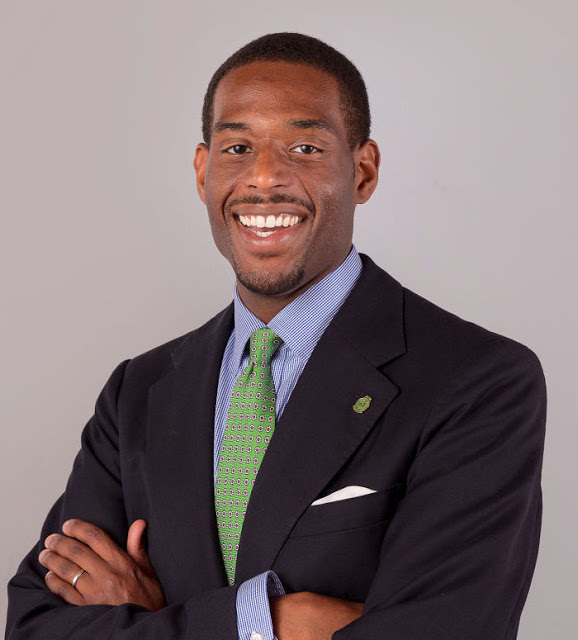 What’s the Cost of Keeping Corrupt Greensboro City Council Members Like Mike Barber in Office? Is Zack Matheny's Replacement Rigged? "...his service on the Minimum Housing Standards Commission that gave Outling insights into one of the city’s biggest policy challenges. 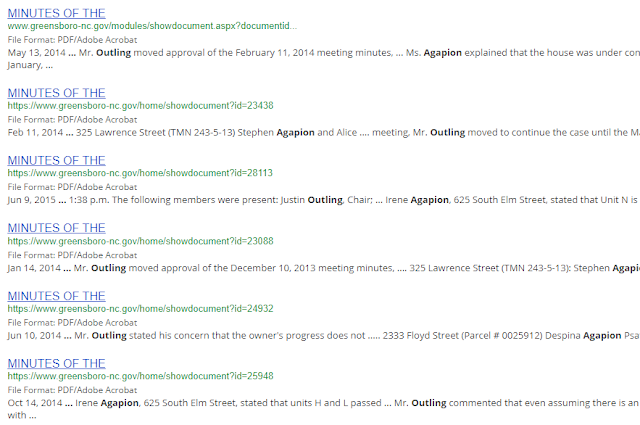 “As chair, I think the group of us did a terrific job of really holding property owners accountable, enforcing the ordinance, and making it clear that if you fail to bring your property up to minimum standards in a timely way then there will be consequences for that failure,” Outling said. 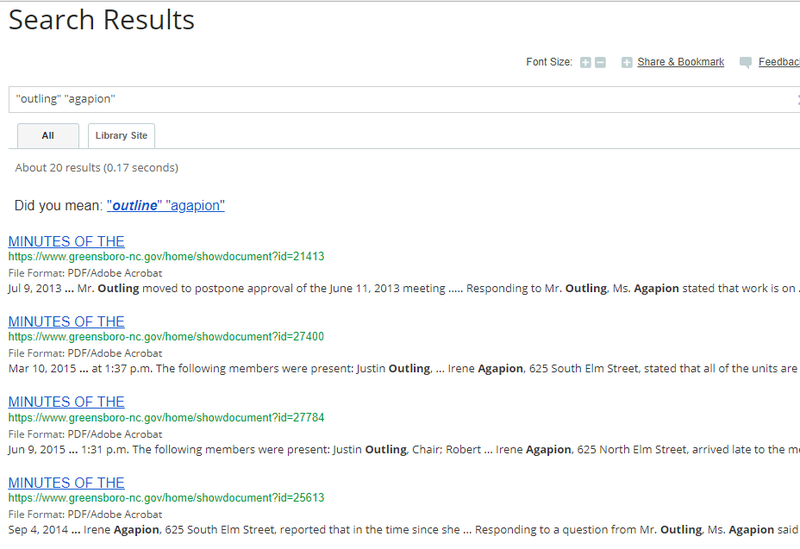 ...After serving on the commission, Outling began to realize that some of the changes he wanted to see take place could only occur if he was on council. He’s already begun to work on a text amendment to the city’s minimum housing ordinance, one he hopes council will pass in the coming months..."